CodeIntel's aggressive Digital Marketing strategy includes SEO services, focusing on your unique niche and service area. Your website is added to our Dedicated SEO Platform. The Platform sends messages to Google indicating that your website is important to leading industry websites, and that your content is relevant to your audience. One of the most popular websites in the US is Facebook. We post regularly on your Business Facebook Page to assist with your SEO strategy. We create the content and schedule posts. You may continue to post on Facebook, too, and engage with your audience. Your website content will be enhanced to further signal to Google that you're the right Loan Officer for your local or niche community. Google rewards relevant websites. That means that your website needs to be updated regularly to list a change in hours, a new phone number, a new headshot, or news about the area. You have until the 10th day of each month to make an update request through our system. Our team will make the update before the end of the month and notify you that the change has been made. Our clients see a dramatic increase in sales and customer satisfaction. Our goal is to increase quality leads so your office and systems can be running at maximum efficiency. We specialize in SEO for the real estate, lending and property management industries. 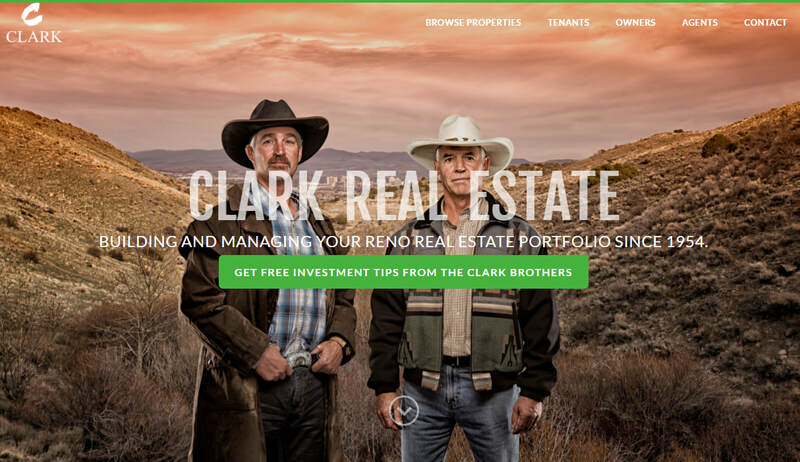 When Clark Real Estate interviewed us their website had been blacklisted by Google. Their decades-old company was struggling. Their previous SEO company broke some rules, and Google penalized them by removing any sign of their domain name from its memory. We asked what their ultimate goal was, in terms of sales and revenue. "Right now, we're managing 400 doors. We want to get to 600 in the next five years," the brothers explained. We rebuilt their website at a new domain and started the gradual process of building their SEO using whitehat/legal practices. We knew Google wouldn't notice the results for several months, so we focused on updating their website to make it easier for their office and current clients to use. We knew they would soon have an influx of clients, and their systems needed to be in working order. Sure enough, their inventory of homes doubled in just over two years, taking their second-generation company from 400 to 800 doors. This surge happened right before Reno's recent boom, meaning their vacancy rate has a waiting list. Clark's number one problem now: how to turn all these great tenants away? We ask for a 3-month commitment, to give Google time to recognize the changes we're making.